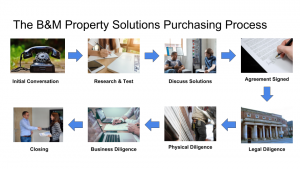 Business Due Diligence - B&M Property Solutions, LLC. Business Due Diligence is the second to last step in the B&M Purchasing Process. This step is necessary for B&M to verify the purchase of your property makes business sense for the organization. We take in all the information from our initial research and analysis coupled with the freshest available data and re-run our analysis as markets can and change fast. We also incorporate feedback and information from our Physical Due Diligence teams (i.e. contractors, inspectors, surveyors, etc.) who typically provide us with more accurate estimates of the costs it will take to execute our improvement plans. In addition to this, we incorporate information from market sources including appraisers, other investors, real estate agents, private lenders and other partners to help determine the feasibility of our options to make a return on B&M’s potential investment in the purchase of your property. Once we have completed this part of the process, your transaction will move to Closing, the final step in the B&M Purchasing Process.